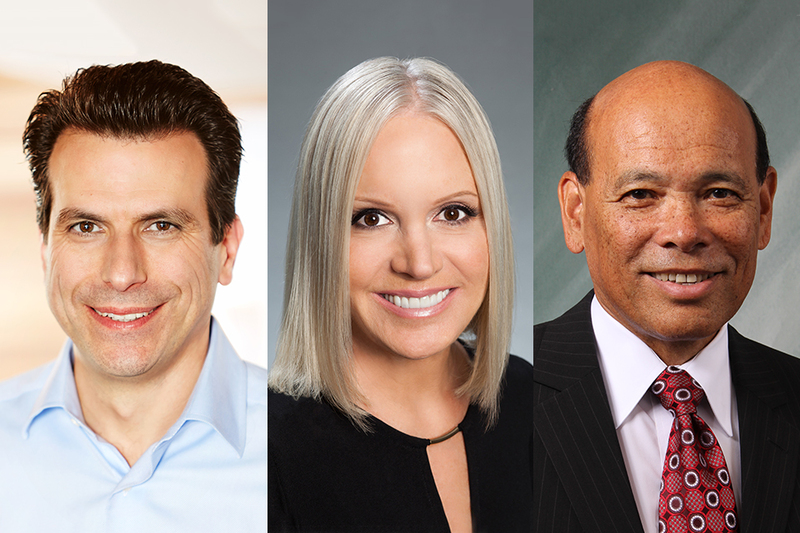 One of Silicon Valley’s brightest stars, Andrew Anagnost ’87 (Engineering), TV trendsetter Michelle Vicary ’08 (Cinema and Television Arts) and notary pioneer Milt Valera ’68 (Journalism) make up the 2019 class for CSUN’s Distinguished Alumni Awards. On Saturday, April 13, CSUN again will honor three exceptional alumni who have brought honor to the university through their successful careers and inspirational character. One of Silicon Valley’s brightest stars, Andrew Anagnost ’87 (Engineering), notary pioneer Milt Valera ’68 (Journalism) and TV trendsetter Michelle Vicary ’08 (Cinema and Television Arts) make up the 2019 class for CSUN’s Distinguished Alumni Awards. Anagnost is president and CEO of design and make software giant Autodesk. The dynamic engineer, innovator, strategist and industry pacesetter worked at the NASA Ames Research Center after earning his doctorate. For the past two decades, he has been part of an impressive team of leaders at Autodesk that has advanced the multibillion-dollar company to astronomical heights. Anagnost is a multi-generational Matador — his mother, Terry, sister, Karen, and brother, James, also earned degrees from CSUN. After personal challenges in high school — at one point dropping out — Anagnost found triumph at CSUN. He became president of CSUN’s chapter of the American Institute of Aeronautics and Astronautics, as well as CSUN’s branch of the American Society of Mechanical Engineers. Anagnost said the university provided him the guidance and structure he needed. In addition, he said, his professors made a profound impact on him. Anagnost earned a master’s degree from Stanford University and later a doctorate in aeronautics and astronautics (minoring in computer science). In 1997, he began working at Autodesk, where he has become integral to the company’s transformation and creating one of the world’s leading design and make automation companies. He has led in numerous roles at Autodesk including marketing, new business development, and product management and development. Early in his Autodesk career, he led the development of the company’s manufacturing products and grew revenue on one of its most innovative applications, Autodesk Inventor, to more than $500 million. As chief marketing officer and senior vice president of the business strategy & marketing organization, he was the primary architect of the company’s move to a subscription-as-a-service (SAAS) company. In June 2017, he was appointed by the Autodesk Board of Directors as the next president and CEO. Under Anagnost’s leadership, Fortune magazine has included Autodesk among the world’s most admired companies. Valera had a similarly rewarding experience at CSUN. Born in Kauai, Hawaii, he moved to Southern California and enrolled at CSUN to study journalism. In 1968, Valera formed his own public relations and marketing agency. One of his first clients was the fledgling National Notary Association (NNA). That same year, Valera closed up shop on the agency and began working exclusively for the NNA, handling its marketing and communications. In 1982, he became the association’s president and CEO. Valera has been the most instrumental figure in the association’s growth. The NNA is the leading authority on the American notary office — serving hundreds of thousands of customers annually — and Valera is one of the most important figures in the notary world. In 50 years with the NNA, Valera has overseen all of the major programs that now define the arena of notary education and support services. He has written standards that have better unified the industry and has consulted with state governors and legislators on notary best practices. Among his greatest achievements is the creation of influential landmark sets of standards: The Model Notary Act and The Uniform Notary Act. He is also the founding editor and publisher of The National Notary magazine and the Notary Bulletin newsletter. Vicary’s greatest achievement is boosting Hallmark Channel’s growth. For that, she has been recognized as one of the most powerful women in the entertainment industry. As executive vice president of programming and network program publicity for Crown Media Family Networks, she has been a transformational figure who has reinvigorated Hallmark Channel’s content, particularly through original holiday programming. According to Adweek, Hallmark Channel was the eighth-most watched channel on cable in 2018 and one of three networks in the top 10 to experience viewer growth from 2017. Vicary joined Crown Media Family Networks at its inception in 2001 and has risen with the company. She commanded Hallmark Channel’s foray into original primetime scripted series, including Hallmark Channel’s long-running and highly rated series “When Calls the Heart,” “Good Witch,” “Chesapeake Shores” and its first family docuseries, “Meet the Peetes.” Vicary also widened the channel’s programming with the addition of Daytime Emmy-nominated lifestyle series “Home and Family.” Vicary has been a central figure in the programming strategy of Hallmark Movies & Mysteries and has rebranded the network to debut popular and highly rated mystery movie franchises, which have become the trademark of the network. CSUN, she said, helped her develop numerous skills. For more information about the event, visit the website https://www.csun.edu/alumni/events/2019-distinguished-alumni-awards.